Whether you like it or not, optical illusions have the uncanny ability to be as maddening as they are amusing and entertaining. 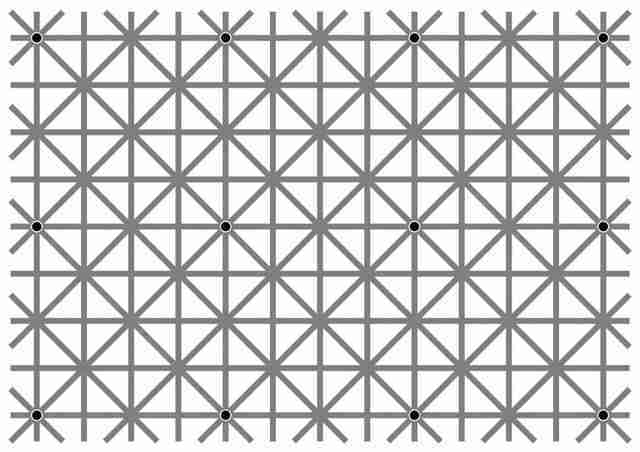 And while it's not causing a global internet meltdown like The Dress, a mind-bending illusion circulating on social media will instantly trick your brain into seeing what appear to be moving or disappearing dots. And, well, it'll probably make you feel like you're going crazy. See how about three or four dots appear to move? Pretty trippy, right? As explained in a report by Sploid, the bizarre image is called Ninio's Extinction Illusion, which is basically a variation of the equally maddening Hermann Grid Illusion. 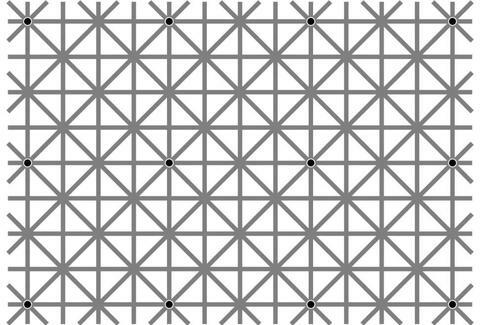 The illusion actually includes 12 dots that are placed at the intersections of vertical, horizontal, and diagonal gray lines. But thanks to the way the light receptors in your eyes work, there's a good chance you can only see three or four of the dots at the same time. A recent video from DNews offers a detailed breakdown on how optical illusions like this work. "When the white disks in a scintillating grid are reduced in size, and outlined in black, they tend to disappear. One sees only a few of them at a time, in clusters which move erratically on the page. Where they are not seen, the grey alleys seem to be continuous, generating grey crossings that are not actually present. Some black sparkling can be seen at those crossings where no disk is seen. The illusion also works in reverse contrast." The illusion soared in popularity on Reddit on Monday after it was shared by game developer Will Kerslake via Twitter on Sunday night and Japanese psychology professor Akiyoshi Kitaoka via Facebook on Sunday morning, according to a report by BBC. So, how many dots can you see? Have fun staring at this thing all day. Tony Merevick is Cities News Editor at Thrillist and has never been a huge fan of optical illusions. Send news tips to news@thrillist.com and follow him on Twitter @tonymerevick.